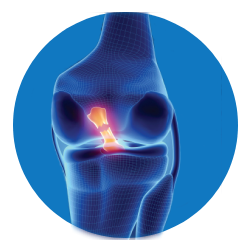 ACL is one of the four main ligaments within the knee that connects the femur (thigh bone) to the tibia (shinbone). It prevents the tibia from sliding out in front of the femur, as well as providing rotational stability to the knee. ACL sprains and tears are among the most common knee injuries. ACL injury occurs to people playing sports that involve sudden stops, jumping or changes in direction like basketball, football, skiing, and soccer.